Dear Peter, please help with this bowl. It is 3" height. Many thanks. This is in shape of what was made 200-year ago for export, a "monteith." It was meant to hold cold water for cooling stemmed wine glasses that had a flat circular foot. The foot was placed outside the monteith with stem in the low part and the bowl of the glass inside the monteith. Yours is much too small to be used like this, so it would be called inspired by a monteith and not really an imitation. 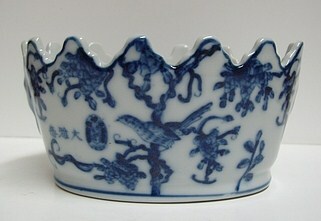 Possibly it was made based on photograph but maker did not know what original was used for. I have the feeling that this is a contemporary fake. 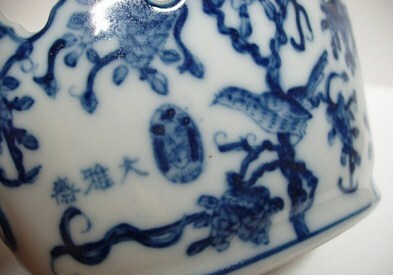 It has two marks that were originally used on items made for the empress dowager Cixi. Dayazhai and the oval mark on the right. The latter is illegible, so it is probably fake. 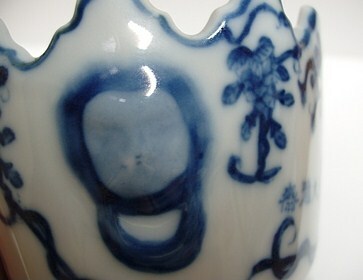 I have never seen Dayazhai blue and white porcelain. Not sure if any did exist. These items were mostly colorful and made after the empress' taste.